Writing authoritative, high-quality content is easier said than done. But if you want to boost SEO rankings, generate traffic and win leads, your content needs to be the best in every way. 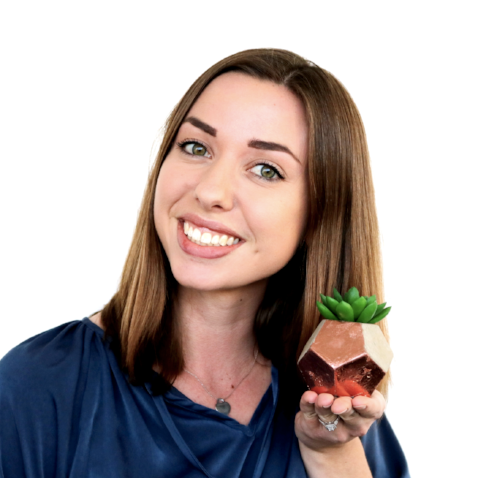 In this guide, we’ll cover four essential content optimization strategies you can use to fine-tune your content and beat out the competition. Content optimization is the practice of making your web page or blog post more attractive to search engines and users. It includes improving technical SEO performance, content copy, user experience and page design to perform and rank better. Follow these steps to guarantee your content is properly optimized and primed for conversions. Before you even open a Word doc to start writing, spend some time extensively researching your topic and keyword by performing a Google search and examining your competitors’ backlinks. Here’s how. You can perform backlink research with a subscription to a site like BuzzSumo or Ahrefs (both start at $99/month). These tools let you enter the URL of a competing site or blog post and see how many sites are linking to the page. Examining the backlink profile of a competitor who's already ranking well for your target keyword, can help you gain insight into the link building that helped them achieve their top placement. Make note of the websites linking to your competitor. You’ll want to target those same sites for backlinks once your content is optimized and ready to be shared. There’s a common belief that short blog posts are the key to a successful content strategy. But recent data proves the opposite. 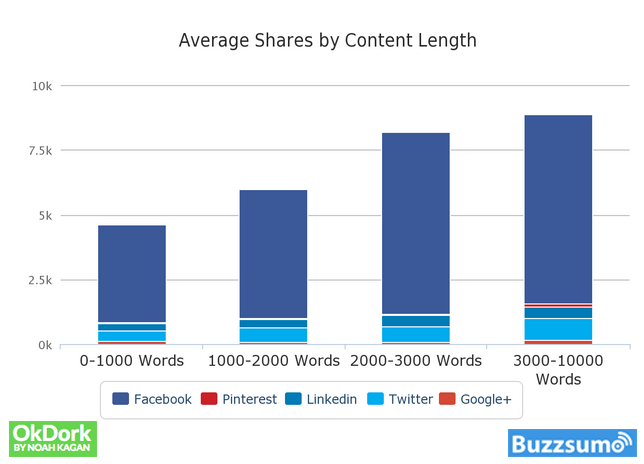 BuzzSumo analyzed 100 million articles and found that the longer the content, the more social shares it gets. 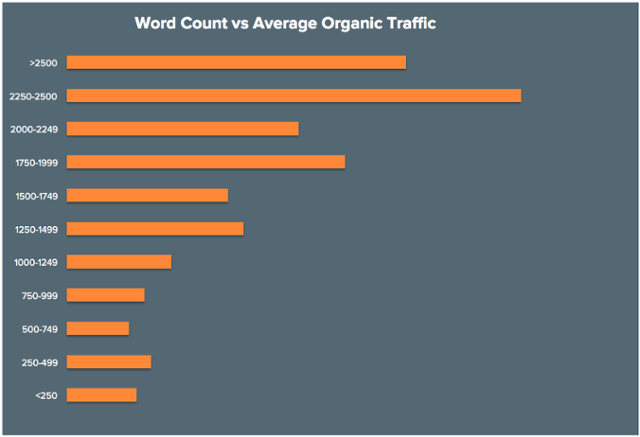 HubSpot discovered that articles between 2,250-2,500 words earn the most organic traffic. Most people aren’t willing to spend the time and effort needed to create in-depth articles packed with insights. But you can’t expect Google to label you as an authority when you’re only offering bite-sized chunks of content. In a sea of 500-word blogs, you’re better off writing one epic, long-form article to stand out from the pack. Plus, you can repurpose long blog posts into other, smaller content offers, such as videos, ads and infographics in the future. 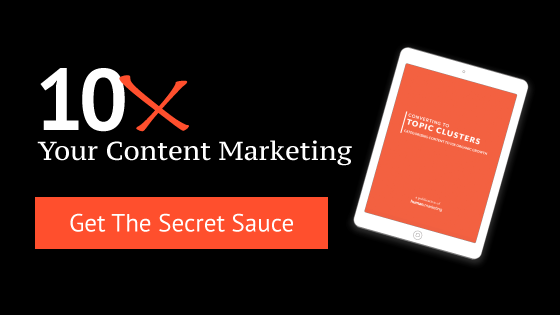 Grow your content marketing 10X. See our collection of FREE actionable, step-by-step guides to help you master inbound marketing and drive real results. Boost the word count. Search for heavily-shared articles with lots of backlinks that rank for the target keyword you’re going after. If the top-ranking article is 700 words long, try to double the length. Add more depth. Many top-ranking blogs merely skim the surface of the topic. Dive deep into the subject matter. List as many actionable takeaways as you can. People who click on your blog should find all the information they’re looking for without having to dig through more search results. Do you answer every question a reader might have? Do you clearly define and explain unfamiliar topics? Add new, up-to-date information. 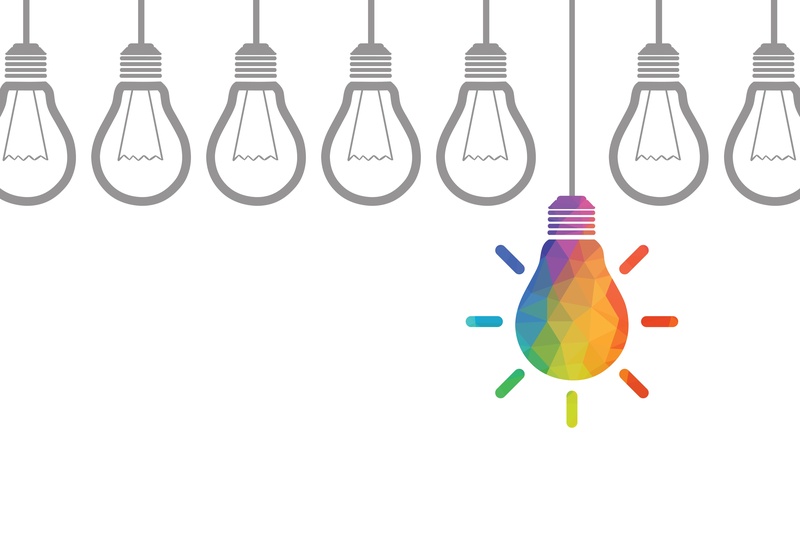 If you rehash the same ideas as everyone else, nobody will want to link to your site. Look for new research and statistics from authoritative sources that back up your point. Contribute fresh insights from your own expertise or from subject matter experts in your company. Make it look prettier. Attractive visuals draw readers to your page and keep them there longer. Feature engaging media like images, infographics and videos to fortify your written content. Remember: The goal of writing long-form content is to provide value to your audience. This isn't high school English, where you're desperately trying to eke out those last few paragraphs to make it to the required 10 pages. Don't stuff your blogs with excess words and repetitive phrases for the sake of upping the word count — it won't work. Written to the audience: Content written for a specific audience generally performs better than content written for everybody. Knowing who you’re writing for will give you a clear idea of what pain points you need to address in your content. Steer clear of excessive industry jargon and overly simple language. Easy to scan: Short paragraphs, bold text, bullet points, lists and callouts make your copy visually appealing and easy to digest quickly. Shareable: Are your social sharing buttons easy to find? Do social media users find your content attractive enough to share it? Blogs with at least one image are shared twice as much as blogs without images. Focused on one topic: Focus on a single topic to stay as clear as possible. If you try to juggle multiple topics in a single blog, you may confuse readers and your objectives will become unfocused. Actionable: High-quality content gives readers a clear sense of how to apply the information they just read. Offer actionable tips and takeaways so readers aren’t left guessing when they finish the final paragraph. Is there anything more embarrassing than getting called out for a false claim or glaring typo in your otherwise perfect blog post? Probably not. Citing shady sources and publishing poorly edited copy can hurt user experience metrics like bounce rate and time on page. Link to reputable sources. Before you link to a source, make sure they are legit. Outbound links to authoritative sites demonstrate to Google that you know your stuff. Links also help search engines determine what your content is about and how it should be categorized. Fact check your research. Your blog is a reflection of your brand. You don’t want to appear to promote inaccurate information. Don’t include a statistic in your blog unless you can pinpoint the original source and verify its accuracy. Edit for spelling and grammar. There’s no excuse for letting typos and poor grammar slip past the editing stage. Online tools like Grammarly and Hemmingway App point out textual errors and suggest ways to make your copy more readable. Readable content will help reduce your bounce rate and keep visitors on the page longer. Properly optimized content has the power to move the needle for your inbound marketing efforts. At Human Marketing, we help companies produce high-quality, optimized content that drives traffic and turns visitors into long-lasting customers.